Kylie Minogue has been singing 25 years, and this album is a celebration of those years. 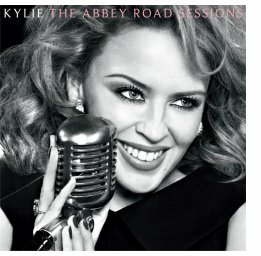 In London, at Abbey Road Studios, Kylie sings 16 of her tracks rearranged and revised. She is even accompanied by a full orchestra, which adds a new sound to those classic songs. There was a big-band feel to the whole album, although at times I felt it was similar to country. Amongst my favorite tracks were the classic Locomotion and the newly arranged Can't Get You Out Of My Head. I also loved Hand On Your Heart. My exact words were, "It has a John Mayer feel to it...." That's good in my books! I love his music, and I love Kylie too. I remember hearing the Locomotion when it came out, back in the 80's, and was happy to hear the arrangement on this album. She stays true to the song, and it worked! The only song I didn't feel was, Finer Feelings. Ironic, right? It just didn't capture me like the others. With that said, I liked the album as a whole and think it would make a great stocking stuffer, or addition to a Christmas gift. DISCLAIMER: I received a digital album for review. I was not compensated. All opinions are my own.